The Patton 2960 remote access server provides 48 dial-up ports, each supporting V.92, V.110, V.90, K56Flex™, V.34+, and ISDN connections. 1U-high 19 inch wide rackmount chassis. The Patton 2960 RAS is an ideal solution for the established Internet Service Provider that is expanding into a new calling area. By integrating capabilities into our 2960 Remote Access Server, the ISP lowers expansion costs and produces revenue immediately. The 2960 RAS integrates 48 analog and digital modems, RAS software, a 10/100 Ethernet port, IP Routing, Frame Relay forwarding, and four E1/T1 CSU/DSUs. 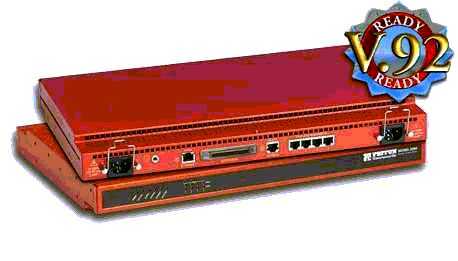 It connects 48 dial-in-modem V.92, V.90, K56Flex, V.34+ or ISDN users to the Internet, IP LANs, or Corporate Intranets. Load-sharing dual-redundant power supplies and integrated Web-based SNMP/HTTP management system capabilities make our 2960 RAS the most reliable and easiest to use RAS in the business!